On the 20th December 2018, The Register ran an article which could have ruined the Christmases of many thousands of InfiniBand customers across the World. Microsoft wishes to jump into bed with Mellanox by tying it up and ruining the best InfiniBand company. It would be absolutely disastrous for Microsoft to acquire Mellanox. Microsoft is known for its rushed releases and terrible support. It is well known for creating unusable updates and breaking critical enterprise systems on a weekly basis. Mellanox is focused on creating the best networks at a reasonable cost. Cisco is focused on much more than networks but Mellanox has remained focused and has created innovations it keeps to itself to enhance its network appliances. Mellanox takes it time releasing excellent firmware, hardware and software to support all of its products. I have tried to work my way into the BlueField(TM) (ARM and ConnectX based) and RISC-V development teams within Mellanox since 2015 under the guise of wanting to release a RISC-V SoC under the name of Tilera. Tilera holds a special place in my heart due to the brilliant people who worked towards a 16-core, 32-core, 72-core and 100-core bespoke ISA and later ARM-based ISA when everyone else was still saying four cores was enough for high-end enterprise and supercomputers. I have a wide range of ideas, plans and proposals for Mellanox. A Microsoft takeover would wreck Mellanox and the InfiniBand industry. Microsoft cannot be trusted with Mellanox. I have emailed many of the executives and directors over the years discussing the next five to ten years of the development cycles of then-past, then-current, then-future, now-past, now-current and now-future products and projects. In Spring 2016, I said to two directors, why is BlueField not being used for the storage market. They said there were no plans to use it for storage. A little over a year later, BlueField was being used for storage applications. 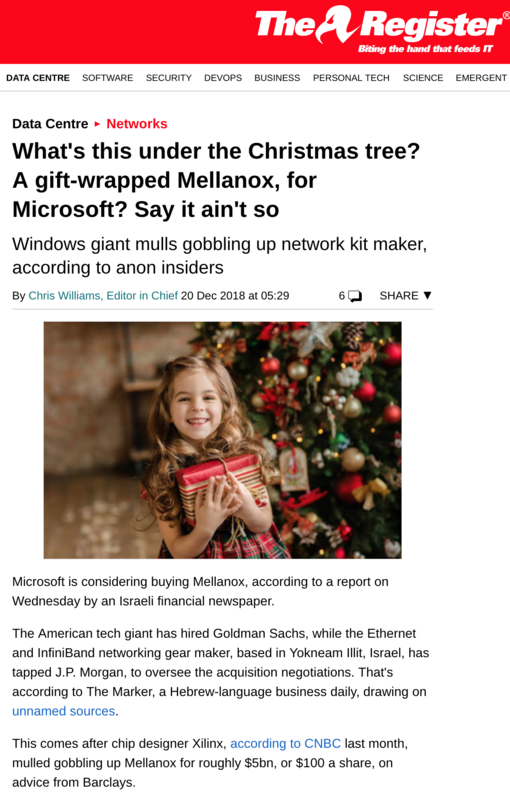 I would love to further Mellanox, I love the company which is why I will be making contact with as many of the Mellanox majority shareholders as possible to discuss why they should reject a Microsoft buyout of Mellanox.